The dog days of summer bring low flows, crystal clear water, and hatches of tiny flies on many trout waters. 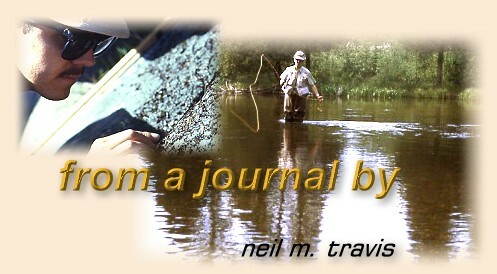 My introduction to this type of fishing came over 40 years ago on Michigan's Au Sable River. Starting in late July and continuing until early September hatches of tiny flies often carpeted the water, and trout noses could be seen poking through the surface film as far as the eye could see. Considered a curse by many anglers I fell in love with this type of angling, and it is a love affair that I still have today. 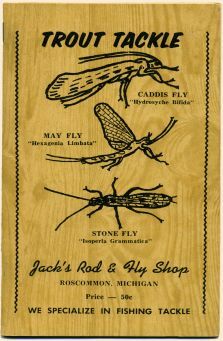 The Au Sable had prolific hatches of midges, tiny black midges that we tried to imitate with flies we purchased from Jack's Fly Shop in Roscommon. Jack and Ann's fly shop was just outside of town, and Ann tied all the flies herself. She tied midges in size 18 and 20, and in the 1960's you could buy them for fifty cents apiece. In the days before I was tying all my own flies I would buy a half dozen tiny black ones and set off to try my luck. It was later that I was introduced to the truly great small fly hatches that the Au Sable produced. Tricorythodes stygiatus, these tiny black and white mayflies are a true size #28, and in those days they hatched in phenomenal numbers. The best fishing was from daybreak until about ten o'clock in the morning. Success was not counted in numbers of fish caught or even hooked since the fish could be extremely selective. Since the flies hatched in such prodigious numbers trying to get a fish to sip in your offering was often more a matter of luck than skill. Tricos, as they are commonly called today, are an interesting insect. The nymphs live in the detritus, the rotting leaf litter found in the quite backwaters, and their bodies are covered with hairs that collect bits of decaying vegetation causing the nymphs to look like a small moving pile of debris. When they hatch they almost immediately molt into the imago or spinner form, and immediately begin their mating dance. When the hatch is heavy the spinner flights of the adults look like fog or mist just over the water. While trout eat the nymphs and the duns the best fishing is during the spinner fall. Generally it lasts longer, and the tiny spinners are easy picking. Pseudocloeon anoka, a tiny greenish-gold mayfly, now renamed Plauditus puntiventris, are another tiny mayfly that hatch during the mid to late summer, except rather than hatching at dawn they hatch late in the afternoon with the spinner fall coming right at dark. They are not quite as small as T. stygiatus, only a size 24, but in the fading light of mid-summer it takes a good pair of eyes to see your imitation on the water. The trout always seemed to like these little mayflies, and JC and I had some memorable evenings on the Au Sable fishing to trout rising to these tiny green jewels.